I LOVE roasted chicken. It is a good old-fashioned family dinner, my favorite part about roasting a chicken is all of the delicious leftovers. One of my favorite dinners to make with leftover roasted chicken is Chicken & Waffles. It’s super easy to pull together. And it works well with roasted turkey leftovers too. 1. Roast a whole chicken. 2. Make chicken gravy from the roasted chicken. 3. Combine any leftover gravy with leftover chopped roasted chicken. Warm up on the stove top. 5. 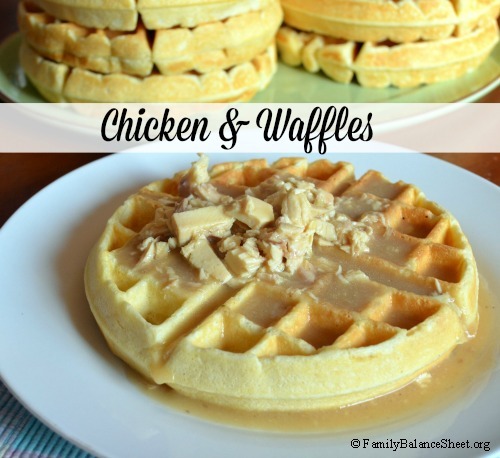 Pour chicken & gravy over waffles. For more chicken recipes, check out my Chicken Dishes Pinterest page.